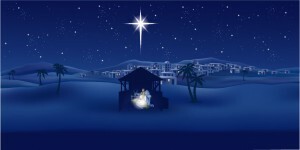 CHRISTMAS TABLEAU – Sunday evening, 5:00 p.m. This Sunday is our annual Tableaux service at 5:00 p.m. It is an enactment of the story of the Lord’s Advent with scripture readings and music to enjoy. This special service is loved by all ages and does a good job of getting one in the true spirit of Christmas. There is no morning worship service on the 16th – just the Tableaux at 5:00 p.m.
CHRISTMAS EVE CANDLELIGHT SERVICE is also at 5:00 p.m.